This week’s challenge over at Heart 2 Heart Challenges is “I Heart Us”. Now, you can take that, as always, in whatever fashion that you want. 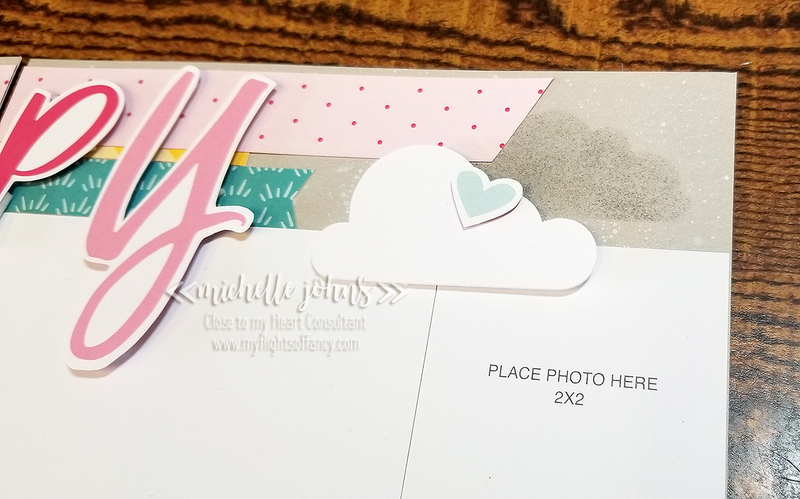 You can use the paper pack with the same name, or the photos that move your heart. 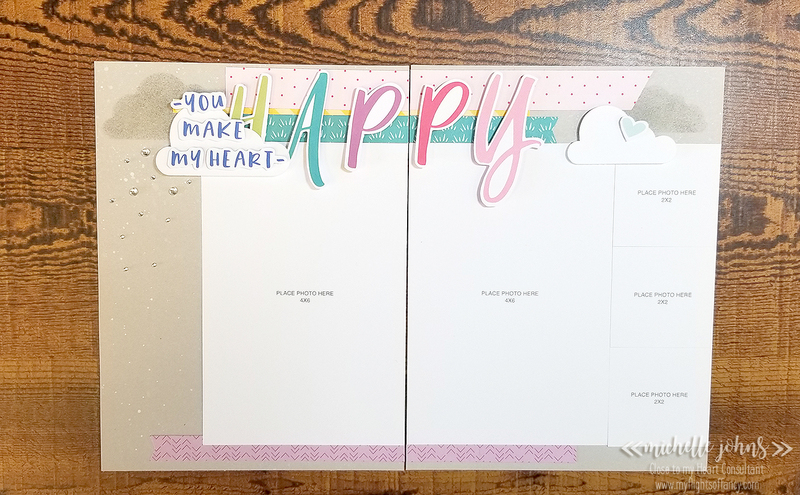 Today I have a fun two page spread for you, but it isn’t your traditional size that you see me make, they are 6×8 pages perfect for the Everyday Life albums! I took the pattern 6 from the Make it from your Heart volume 1 book. Those patterns are for 12×12 pages, so I had to do some figuring, but I did, and made it work for the 6×8 pages! First I started with some mink cardstock cut to 6×8, then I made some masks with a couple of clouds, and did some white ink splatter around the edges of the pages with my water brush. Next I used the negative of those clouds to be able to sponge some pebble and charcoal inks onto the cardstock to create the darker clouds. I cut the title from the cut apart page from the I heart us paper pack, as well as the strips of paper. I used some foam tape to pop up the title and the clouds. Sparkles and Bitty Sparkles make some fun ‘rain’ on the left side of the left page. I created a cut file for you to use, if you have the Artistry cartridge, you will be able to recreate this page in no time! You can find the file here. ← I love color, how about you? Great layout! I love the way you used the clouds and the splatters. Michelle, I really like your layout. Back when I started scrapbooking I was limited in space, so I started with 8.5” x 11” pages in an album. Once I started, even after having more room to craft and display, I kept going with that size for continuity. Although I have done scrapbooks for other people in the 12” x 12” size, my bookshelf continues with the 8.5” x 11” size. I like that you pointed out it takes “some figuring” to balance smaller pages because it does! I also like the variety of techniques you used (splatter, sponge, etc.) and the sparkles are a perfect embellishment. Thanks so much! I have been working with two page layouts that are 12×12, and sometimes they are hard! (harder with paper than digital!) I think this smaller size is so much fun! I’m really glad you liked the layout! Thanks for leaving a comment!